June is very much a month for harvesting with an opportunity to make some late sowings. The raspberry canes are a bit choked by couch grass in some areas so may need digging up and replanting in the autumn. Sadly the birds (I am assuming it was birds and not poachers) stripped the lot before we had time to pick them. Building a fruit cage is onbviously a task for the autumn. The outdoor cucumbers which I bought from the Allotment Holders' sale were looking good at the beginning of the month but need some encouragement to actually climb up the netting which I have provided. The ones I grew from seed are just a couple of inches high. Although we have been watering regularly, the lettuces are beginning to bolt. Some were grown from seed planted in the winter and having survived the cold and the wet at the beginning of the year, it would be sad to lose them now. One crop that seems to have done very well is the onions and we will be harvesting and drying them off later this month or next. In the meantime a spot of hand weeding is required! 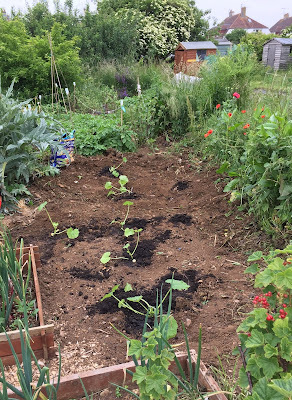 I have managed to clear a raised bed to sow some dwarf French Beans which hopefully will be up next month. 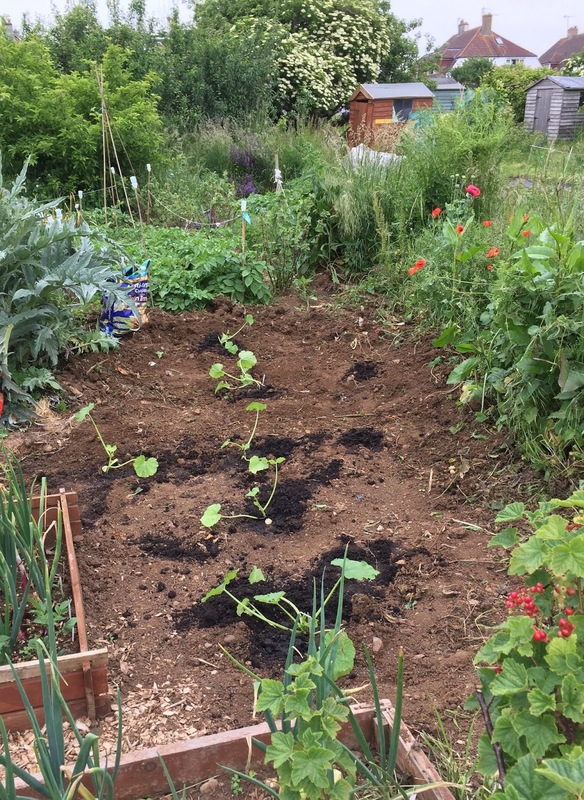 And we have erected a new frame for some climbing French beans (and planted a pumpkin in the middle of the rows). The purple sprouting broccoli has been planted out. We have protected the plants from pigeons with mini-cloches made from plastic bottles and will keep a watchful eye for caterpillars. The plants look very vulnerable! What we had hoped was a Globe Artichoke is regrettably a Cardoon. It's very decorative and no doubt will be stunning when the flowers open - but its not an artichoke! Its over 2m tall and has a spread of 2m so it is taking up a lot of room and no doubt depleting the soil of water and nutrients. So, sorry but it has to go. The courgettes, marrow and pumpkin plants are all looking good. I bought the plants from the Allotment Holders' plant sale as the ones I had grown from seed had all been eaten so I am not sure what varieties they are or which are the marrows and which the courgettes! I have planted them in what was an overgrown wilderness of couch grass, nettles and bindweed next to the cardoon, where the previous plot holder had grown cabbages and sprouts and obviously some Duke of York red potatoes which we keep unearthing! And at the end of the month we had the first courgette in flower. We have harvested our peas - Kelvedon Wonder - and they were so good we have made some more late sowings of both Kelvedon Wonder and Boogie. Our first peas - best eaten from the pod! June was the month to dig up the first early potatoes and the first to crop were the Rocket variety. This is supposedly the earliest cropping variety but various sources suggest it is not best for flavour. They are right. They do not taste like the freshly lifted new potatoes I remember from my youth. They are just bland potatoes. 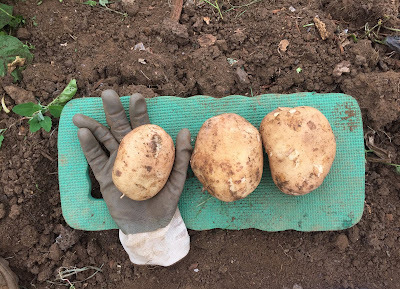 They also don't look like new potatoes as they are the size of baking potatoes! They do seem popular with slugs though! Many were pitted with large holes made by slugs -some were still in residence but most had been vacated only to be re-occupied by woodlice! I lifted one plant of later Charlotte potatoes to see if they had suffered the same and they had not. Speaking to my colleague and fellow plot holder, Simon, I discovered he had the same problem and only his Rocket potatoes were affected by slugs and not the other variety he had planted. Well, that's one easy decision - I won't be growing Rocket again. We had a few surplus seed potatoes, Vivaldi and Nicola, and some old plastic recycling boxes in which we made some late plantings - so hopefully will have some new potatoes before Christmas! And we are making sure they are well watered. Earlier in the year I had planted a mixed collection of lettuces bought from the garden centre and we have lifted our first from the crop and it was very good - lollo rosso. There is still no sign of rain in what has been the driest June on record and at the end of the month we're off to Spain! Bad timing. Urgent need to recruit volunteers for watering duties.